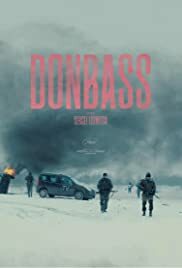 DONBASS is a series of highly charged vignettes set in various locations (command post; community centre) in occupied Ukraine directed by Sergei Loznitsa’s (The Trial). It is an often scathing political commentary following the ugly war that has been raging in Eastern Ukraine for years, wielding both artillery and propaganda as weapons. Not all the vignettes make sense and they are loosely connected – a sort of interpretation of events by Loznitza. They are very well acted and with conviction by unknown actors that are repeatedly seen in more than one vignette. The best segment is the first one with two ladies arguing fiercely after one of them pure a bucket of shot over an official during a community conference. The film would have been more effective if it made more sense and the audience could see what the director is aiming for. Still, DONBASS won the director Best Director at Cannes’ Un Certain Regard Section.